What Diseases Can a Dog Catch From a Cat? Most dog and cat diseases are species-specific . When you've got more than one dog, one of them getting sick means quarantining the patient to ensure the illness doesn't spread to the rest of the pack. If you've got a dog and a cat, though, it's difficult to know if one can catch a disease from the other. Dog and cat illnesses tend to be species-specific, meaning that cats and dogs don't usually spread disease to one another. There are just a few exceptions, one being the fairly recent mutation (in the past 10 years) of the canine parvovirus allowing it to transmit to cats. In his book on viral ecology, Christon J. Hurst explains that feline panleukopenia virus and canine parvovirus are similar diseases that both causing vomiting, fever and diarrhea among other symptoms. Both being parvoviruses, they used to only infect the species they were specific to, but the variation of the canine parvovirus that now easily passes from dog to cat poses the concern of other new viruses that can be transmitted to a diverse assortment of hosts. Rabies is the best known disease that can be transmitted between species, including between dogs and cats. The virus is mostly present in the saliva of an infected animal, making bites the most common way for the disease to be transmitted, although Vet Info notes that transmission can occur through scratches as well. Rabies is fatal, as there is no treatment for it, making it all the more vital for you to keep up on your pets' vaccinations. 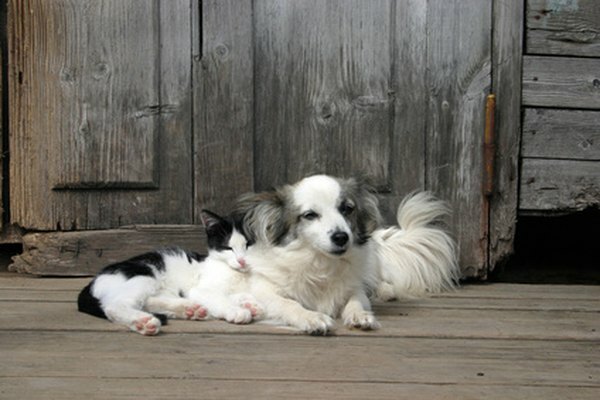 Some skin conditions, such as mange and scabies, are communicable between dogs and cats, as they are caused by mites that can move from one host to another. The symptoms of mange are loss of hair in patches and red, irritated skin with oozing blemishes. Scabies is actually a form of mange that causes itchy, red skin and some hair loss. These skin conditions can clear up on their own without treatment, but if you have more than one pet in the house, it's best to see your vet for medical attention to reduce the chance of spreading and prolonging the condition. Fleas and ticks aren't a very selective lot and will happily jump from host to host, making them one of the conditions that can be shared between dogs and cats. If one of your pets brings the unwanted visitors home, it is best to treat all your pets to ensure they don't spread before you get a chance to eliminate them. Ticks like to stay warm and sheltered, so they aren't as adventurous as fleas can be. Although ticks may not spread as quickly between pets, the danger of contracting Lyme disease from them makes it important to rid your pets and your home of them as quickly as fleas. Does the Indoor Dog Restroom Work? Is There Such a Thing as a Miniature Golden Retriever? Can Coronavirus Be Spread From a Cat to a Dog?